Andy Murray has withdrawn from next week's Rogers Cup in Toronto to continue his recovery from hip surgery. The British former world number one has only played in three tournaments since having the operation in January. Murray, 31, says he will now focus on preparing for the Cincinnati Masters, which starts on 13 August. "I've played quite a few matches this week in Washington and I need to be smart with my rest and recovery as I come back from injury," he said. 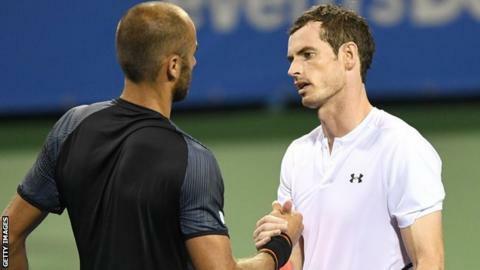 The Scot, a three-time champion in Canada, has won three matches in four days at the Citi Open and has said that he might not play his scheduled quarter-final against Australian Alex de Minaur later on Friday. He broke down in tears after completing his last-16 victory over Romanian Marius Copil at 03:02 local time on Friday. Murray made his comeback after an 11-month absence at Queen's in June and also played at Eastbourne before deciding he was not fit enough to compete at Wimbledon last month. The US Open, the fourth and final Grand Slam of the year, starts in New York on 27 August. "I'd like to thank the tournament for a wildcard, I always love playing in Canada and look forward to returning next year," Murray, a three-time Grand Slam winner, said. "My plan is to head to Cincinnati early next week. Appreciate all the support this week in Washington, it's amazing to be back playing."